My girl sure loves her artichokes. 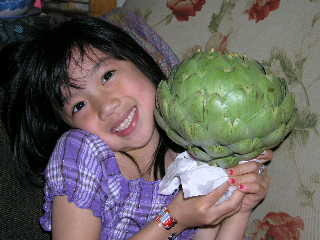 My daughter Sofia, 6, is a vegetable avoider generally, but she loves artichokes every chance she gets. She polished off this grand specimen, almost bigger than her head, pretty much all by herself, with very little help from Mommy and Daddy. She even expertly removed the choke when the time came. Pliny (23-79 AD) called them “monstrosities” and Goethe (1749-1832) sneered “The peasants eat thistles” after a visit to Italy. But Sofia and I disagree. Artichokes are the lobster of vegetables: luxurious, extravagant and so perfect in flavor and texture that they need at the very most a dab of drawn butter as embellishment. But in the Mediterranean they’ve long been dreaming up wild things to do with them. In Sicily, where the artichoke may have originated, they eat frittedda in spring, a vegetable medley with young artichokes, early peas and fresh fava beans. In other parts of Italy they cut the hearts into wedges and fry them; my late Tuscan father-in-law Angelo would use an egg-based francese batter. With the tiny, tender, chokeless ones (not really babies but lateral shoots of the king artichoke from the top of the stalk), they slice them paper thin and dip them raw into good extra virgin olive oil with salt and pepper. Or they spotlight them in a risotto or frittata or merely halve and stew them with onion, garlic and parsley. Another Italian preparation is to stuff the center and each leaf before baking with a mix of oily bread crumbs, grated hard cheeses, garlic, parsley and perhaps mortadella, prosciutto, pancetta, anchovies, olives, currants or capers. And there’s the classic flattened and flash-fried carciofi alla giudea, or Jewish artichokes, a specialty of Rome. The Italians even make an artichoke liqueur called Cynar. In Greece they treasure the ‘choke as well, dressing it cold with olive oil and lemon juice, or stewing it with lamb, tomatoes and dill, or with veal, aniseed and egg-lemon sauce. In Spain their alcachofas con piñones are stewed quarters with bacon and pine nuts. Moving to the U.S., we go to one of the artichoke’s first entry points, Louisiana, where they put them in their creamy classic oyster and artichoke soup, or gussy up a stuffing for them with bits of shrimp or crabmeat. A great brunch dish, similar to Eggs Benedict, is Eggs Sardou, with artichoke bottoms and creamed spinach standing in for the English muffin and Canadian bacon. Wish I had gotten to try these treats during my recent trip. Old-fashioned American/French treatments for artichokes include dousing them with globs of cream sauce or cheese sauce, like in Mastering the Art of French Cooking by Beck, Bertholle and Child. In the 1972 James Beard’s American Cookery he recommended an assortment of sauces for hot boiled artichokes that included black butter, hollandaise, béarnaise, mousseline, mustard sauce or herbed vinegar “for dieters.” He also suggested filling them with crab, lobster or shrimp salad, avocado cubes in Russian dressing, chicken or duck salad, “turkey hash” or sweetbreads. Unadorned, an artichoke is low in calories and high in protein, fiber, vitamins and minerals. Its cynarin and silymarin are said to regenerate liver cells. Like dandelions, it’s one of those spring tonic foods whose bitterness, vitamins and minerals give you what your body needs after a winter lacking in fresh vegetables. First of all, your daughter is adorable. And where, pray tell, did you find an artichoke that size? Holy cow! I’m glad to know it was tender because I generally shy away from oversize produce, assuming it can’t be as good as the more petite versions. But clearly Sofia knows her stuff!